The latest review period to be launched covers the Top Rated Runners service on Betting Gods. 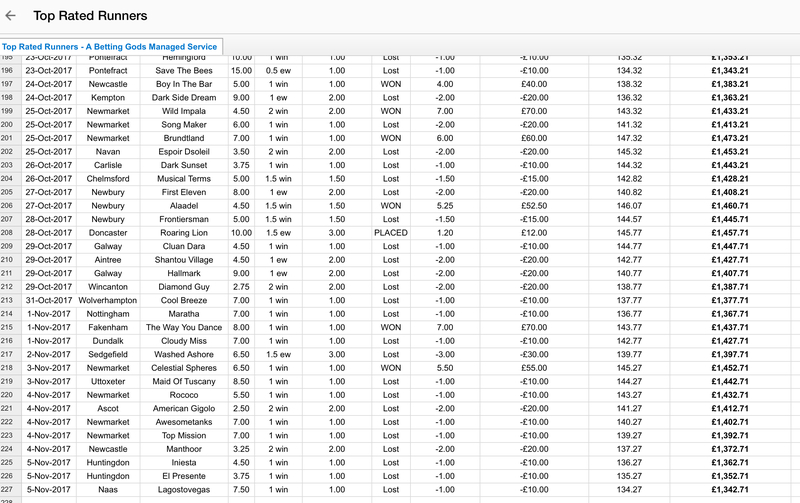 With average monthly profit of £332 it’s certainly worth a closer look. The strike rate (percentage of winners) also appeals with 1/3 selections successful on average. Top Rated Runners has grown their total bankroll to just over £1350 from £10 stakes per unit over the period July – October 2017. An immediate concern would be if the service can maintain this level of growth and return on investment long term. This is an area we will analyse in detail over the coming months of the review.